The well proven capabilities of the Combi DP drop packer have been enhanced with a higher level of efficiency. Integrated into the frame of this state-of-the-art drop packer is the efficient Combi 2-EZ®HS high speed case erector. Now an even larger variety of product sizes, shapes, weights and materials can be quickly and easily packed in large cases at speeds up to 25 cpm, while still maintaining a compact footprint. 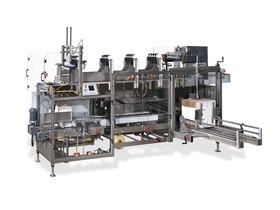 As with all our drop packers, adjustable lane guides can be quickly and easily reconfigured, giving the user the flexibility to pack multiple products on the same line.